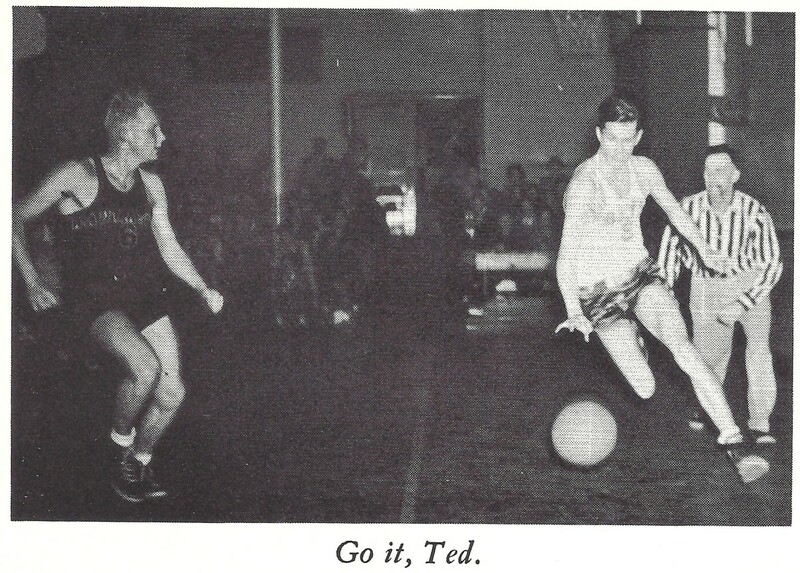 Photos From My Mother's High School Annual in 1943. 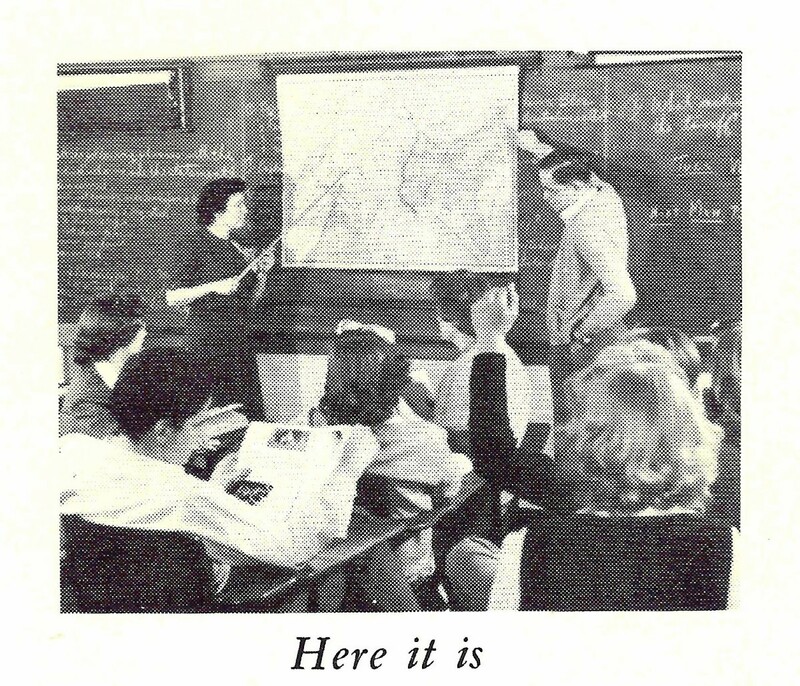 The war effort was supported by almost everyone back during WWII including students. My mother grew up living in Milwaukee, Wisconsin with her family when she was a child. 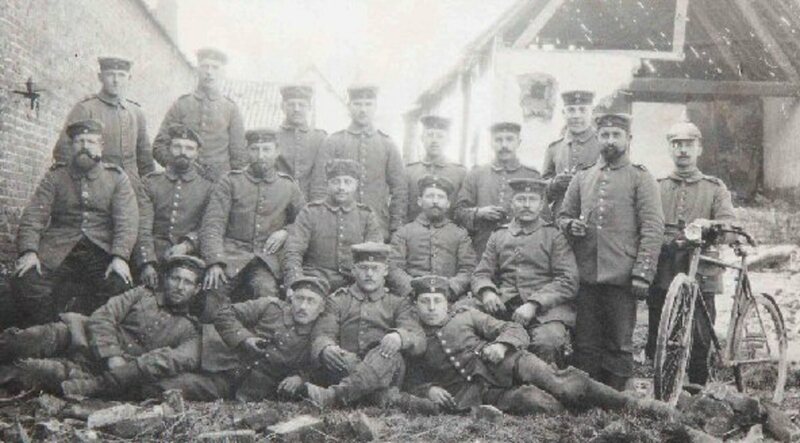 It was a close knit family of German heritage. It consisted of her parents, an older brother who was the eldest of the siblings and an older sister. She was the baby of the family with a five year spread between herself and her sister. Her maternal grandfather lived with them during his older widowed years until he died. Her parents also owned a summer cottage on Okauchee Lake. The home where she grew up as a child in the City of Milwaukee no longer exists. But the Whitefish Bay home where her family had moved during her high school years still stands. We drove past the home in Whitefish Bay which is a suburb of Milwaukee the last time my mother and I were in Wisconsin. It still looks as though it is being well kept and hopefully enjoyed as much as my mother's memories were of having lived there. That is where she attended high school and I have her 1940 and 1943 annuals. She was a senior in '43 and no longer has any need of these annuals. There are probably a few of her classmates that might still be alive but most of them have probably already joined her in the next life. It is obvious where the name "The Tower" originated. A portion of the building has a very imposing and upright edifice which was featured on page 5 of the annual. 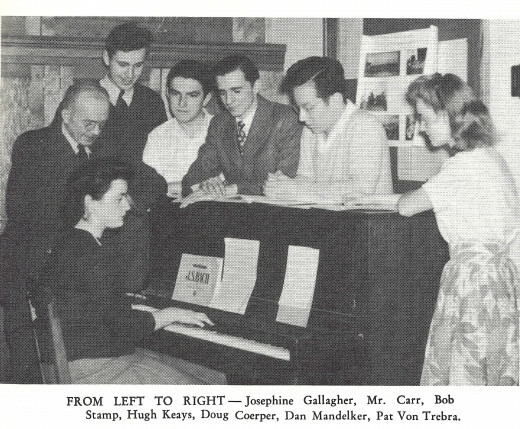 Across from it on page 4 was their school hymn which was written and composed by Bob Stamp. 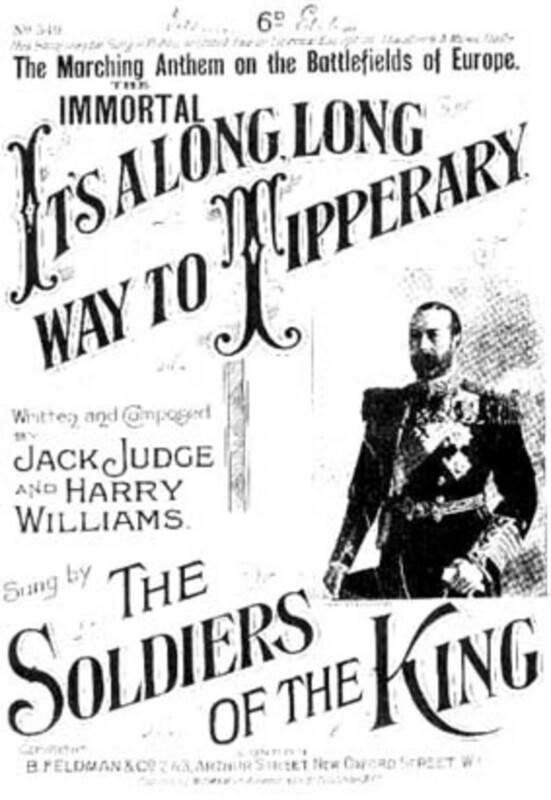 The song was copyrighted and published by the Music Department of the High School. The title of the song is "THE TOWER OF WHITEFISH BAY." THAT FILLS OUR HEARTS WITH SONG. FROM THE TOWER OF WHITEFISH BAY." I am sure that my mother fervently and proudly sang that song often as did many if not most all of her other classmates. 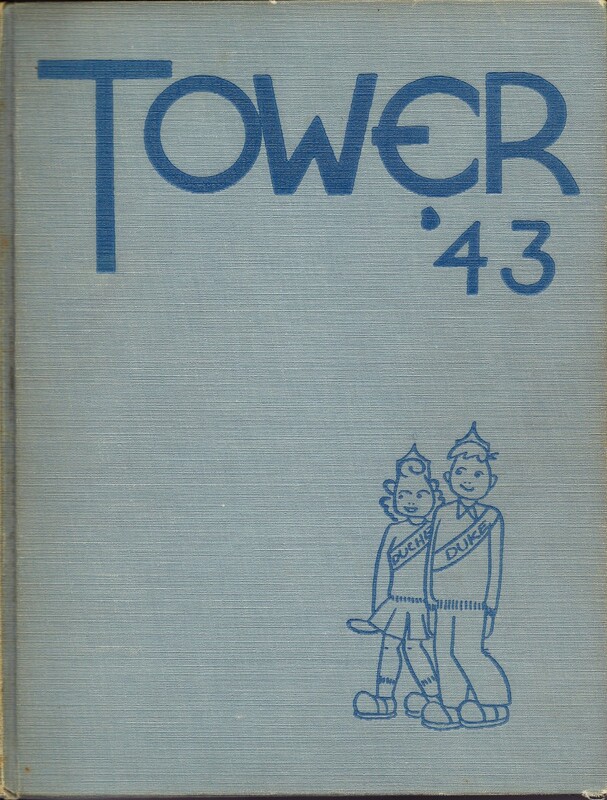 Page affixed to inside cover and next page...both front and back of Tower '43 High School Annual. This may just have been the last "popular" war in which the United States of America became embroiled if "popular" is a word to describe any war. Suffice it to say that almost everyone in our country was involved in small or large ways with the war effort. This included the students at Whitefish Bay High School. We, who are graduating into a world of war will remember our last year in high school as one of commando training, jeep buying campaigns, pre-induction courses --- and, a year without a prom. We will long remember this year when many of our junior and senior boys left for the armed forces. It is to these boys that we, the class of 1943, dedicate this Tower." 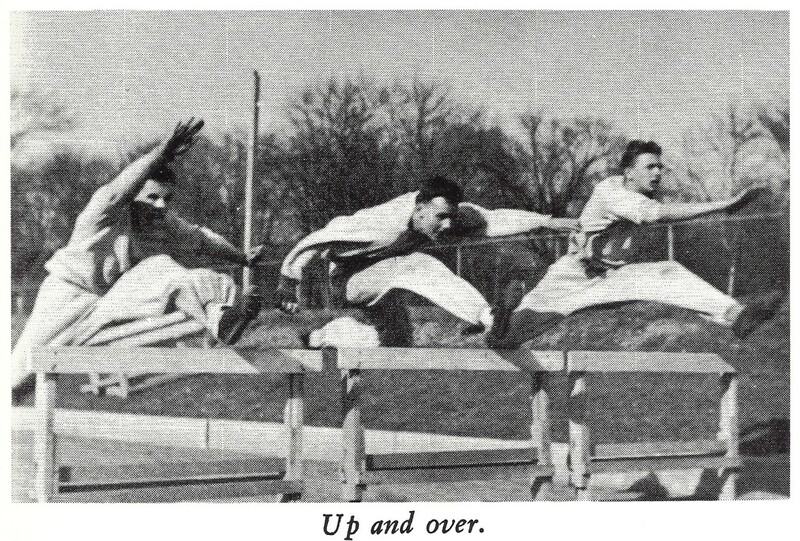 Numerous photos in this book relate to things being accomplished by the students to aid the war effort during World War II. 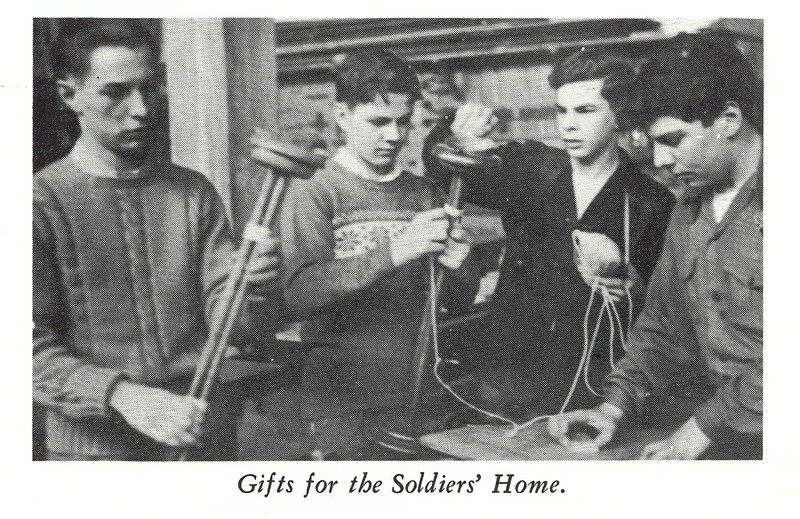 From Whitefish Bay 1943 Annual - Students selling war stamps to help aid the war effort. 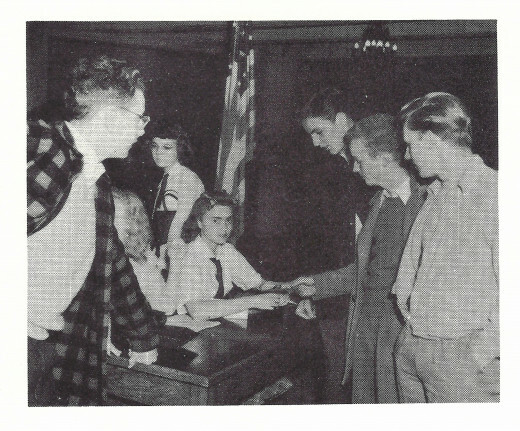 "In an all out effort to aid the war program, students participate wholeheartedly in buying war bonds and stamps. 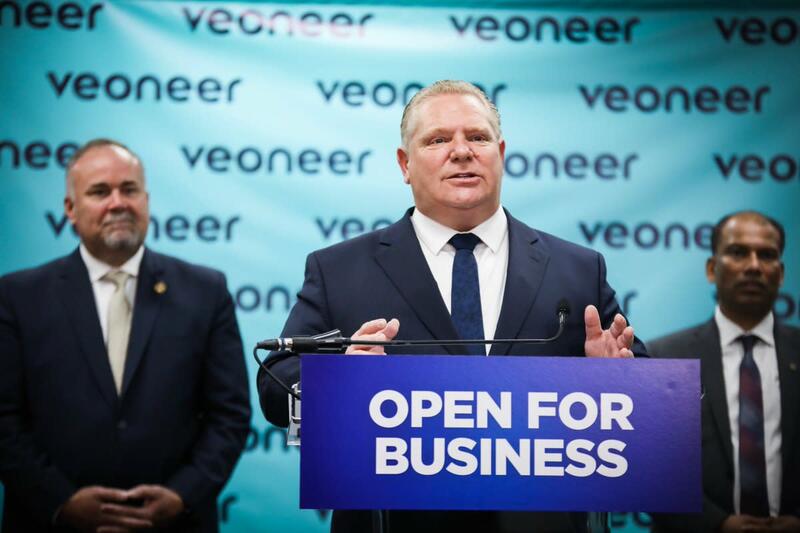 Hi-Y, Froshmore Alliance, and Tower Club sell stamps three times a week in the front lobby." Bugs Bunny War Bond Drive WW2 Cartoon Played in Movie Theaters. 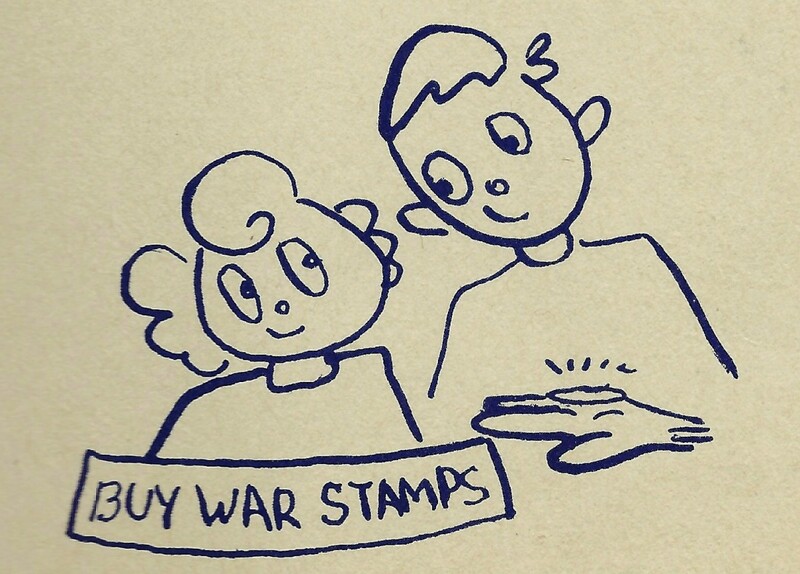 War bonds and Stamps Sold Would Help Pay for the War Effort. "Sponsoring a drive to collect books and magazines for service camps, the National Honor Society collected 150 books and 650 magazines." Additional information gleaned from reading my mother's annual continued to be of interest. According to another caption "Junior and senior girls are doing their part in the Civilian Defense program by serving as assistant block leaders. They collect vital salvage from homes in their blocks and distribute pamphlets and questionnaires." 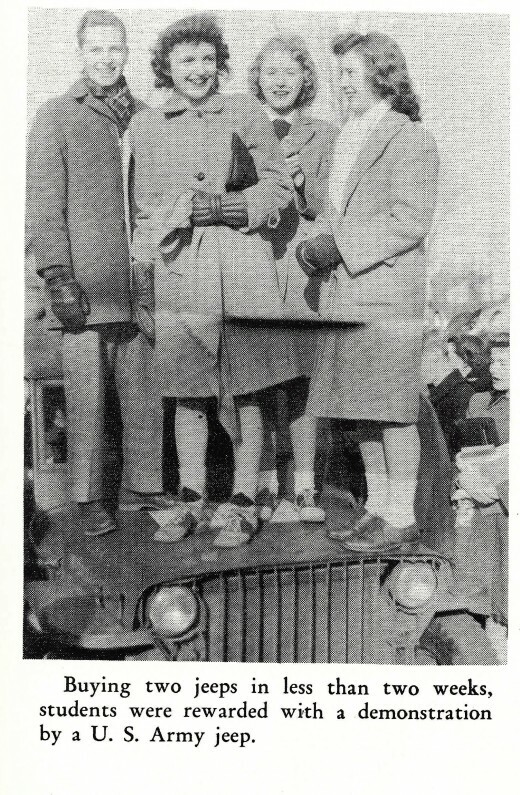 It was the Student Council who was responsible during "The Pearl Harbor Day Drive" for gathering enough money together to actually fund the purchase of two army jeeps! That and their "April Bond Drive" were among their significant accomplishments that year. This combination word stood for the organization composed of Freshman and Sophomore girls who normally met for recreation as well as social service. The social service part of it had more meaning in this war year. 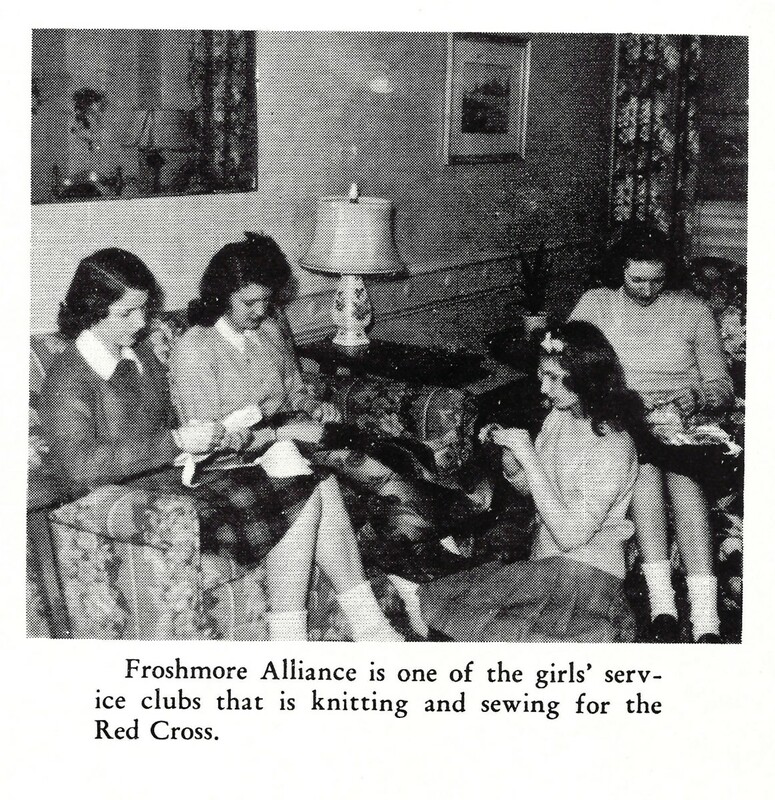 They sewed articles for the Junior Red Cross and parka hoods for the British War Relief. They also collected used toys and presented children at the St. Rose's Orphanage with Christmas gifts among their other activities and accomplishments. They also had some fun. 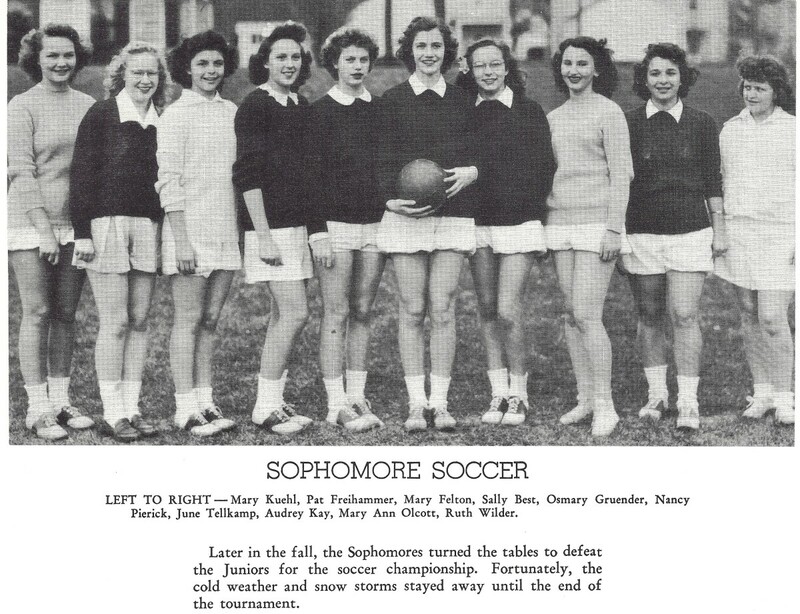 It was not all doom and gloom during those high school years just because of the world war. They did have their annual "tea and tag dance." 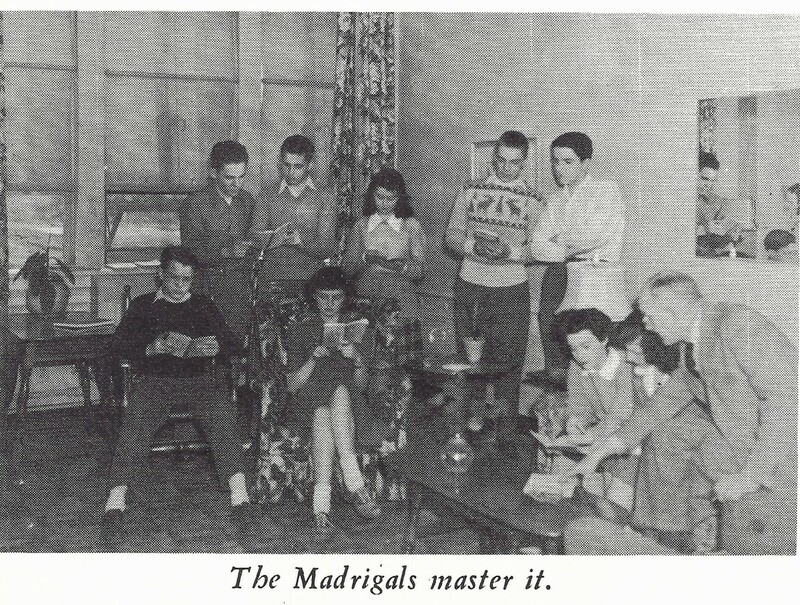 The Madrigal Club sang before church groups, civic organizations, and even shut-ins. 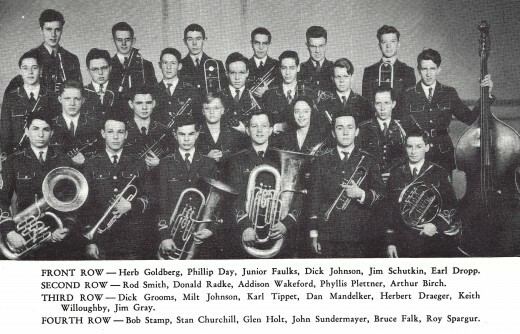 Photo of some members of the band which totaled fifty-one individuals that year. 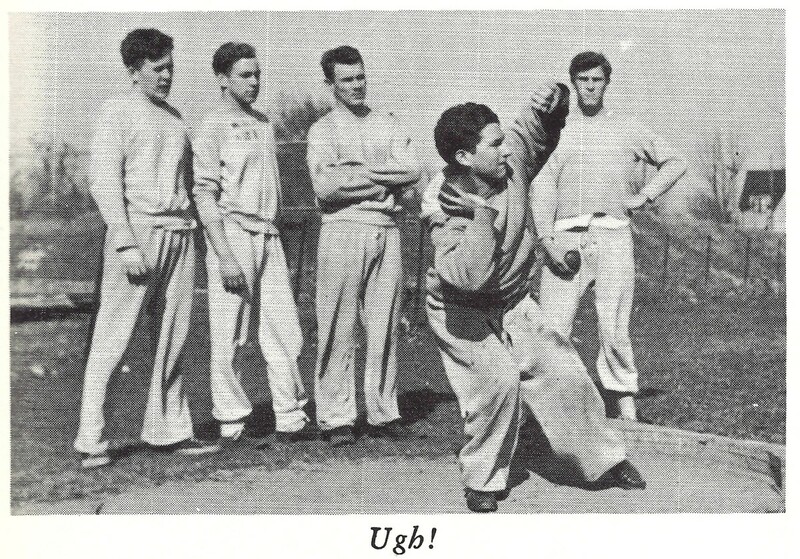 Just because of the world war it was not all doom and gloom on the home front despite the shrinking numbers of classmates and even instructors leaving the school to join the armed forces. The remaining Whitefish Bay students had plenty of fun and numerous activities to keep them happy and stimulated. 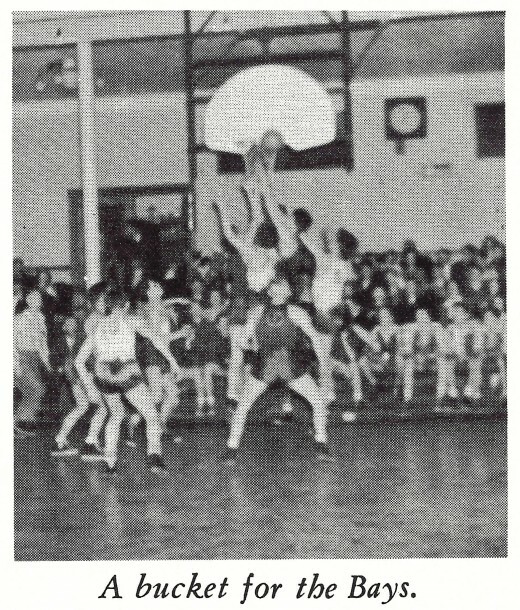 I was amazed at the number of different athletic opportunities that existed for the Whitefish Bay High School students given the size of the school. 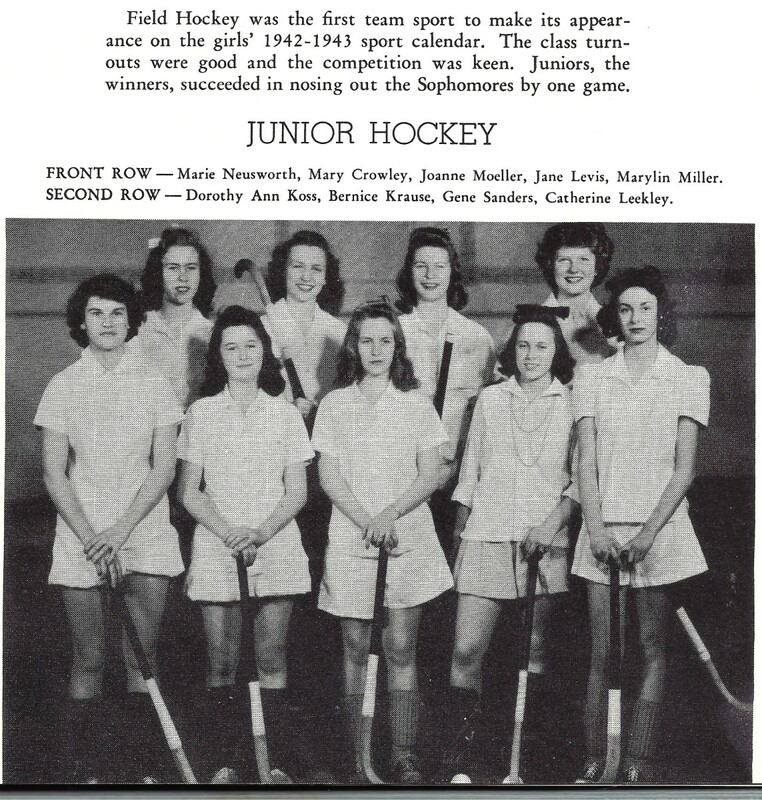 A total of 577 students were pictured in this 1943 annual with 79 of them in the Senior Class, 158 in the Junior Class, 168 in the Sophomore Class and the remaining Freshmen numbering 172. 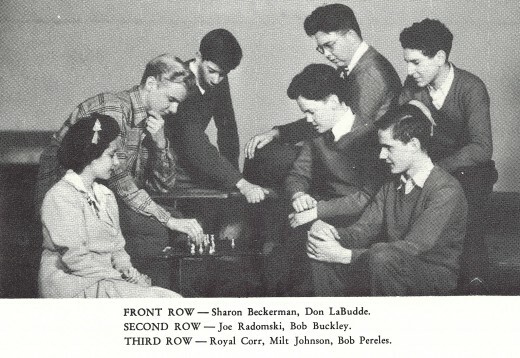 The Milwaukee, Wisconsin area was heavily settled with many people of German heritage back in those days and their Turnverein Clubs may have had some influence with the local school boards as far as encouraging a great number of fun and stimulating activities which included exercise. 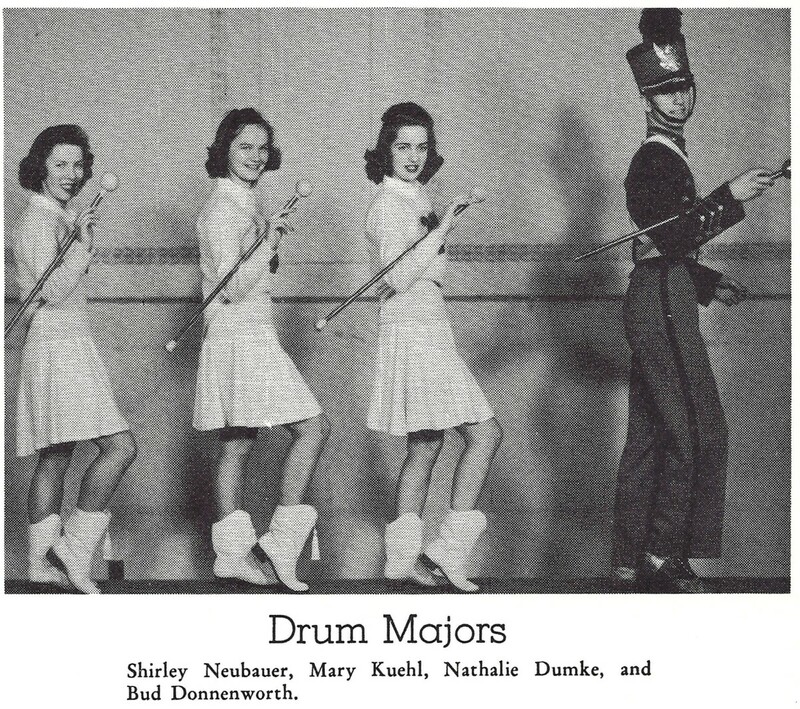 The band and these drum majors would have been busy at many of the athletic events. 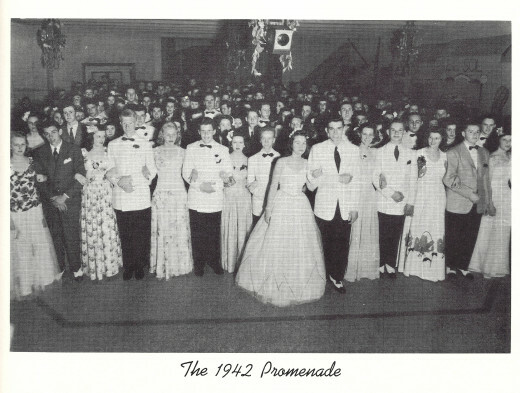 Although in 1943 because of the war, there was NO Prom, I speculate that they put this photo into the album probably because some of the same students would have been attending the school also in 1942. Fun to see the styles back then! 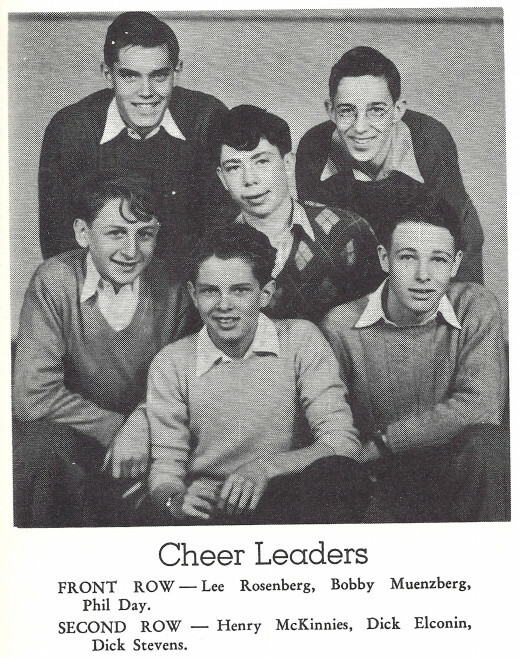 My mother had a lot of fun in high school and one of her good buddies remained as such all throughout their lives. In fact after Lois Petry married she and her husband became godparents to my brother Jim. My parents also became godparents to one of their children. The kids from each family called the other parents "aunt and uncle." Although it was merely an honorary title we could not have thought of them any more endearingly than if in fact their bloodlines made it so. This is what was written about my mother's long time buddy. Her dark eyes and cute grin have won "Pete" many friends. Her four years' work in Junior and Senior Choirs merits real praise. As another Fox Pointer, Lois also enjoyed Home Ec. Club her Sophomore year." 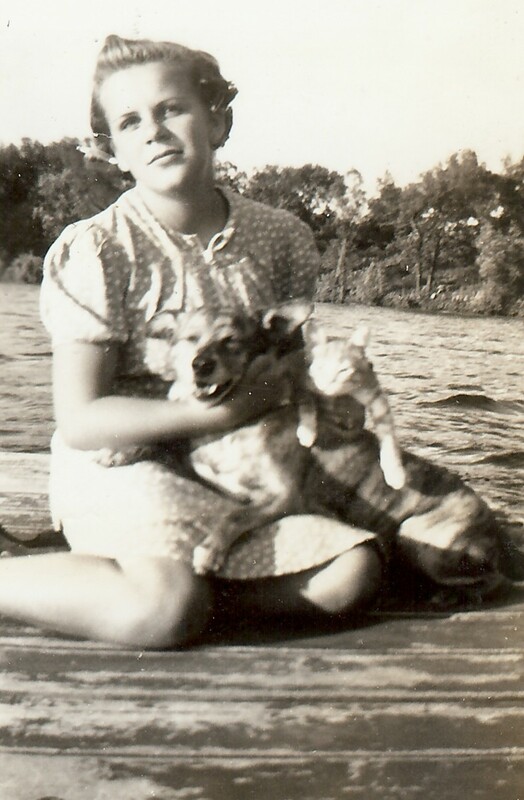 My Aunt Lois went on to become a registered nurse and until she died was a fast and loyal friend to my mother. I intend to pass these high school annuals on to her daughter Julie who will cherish them and pass them down the line to her children. 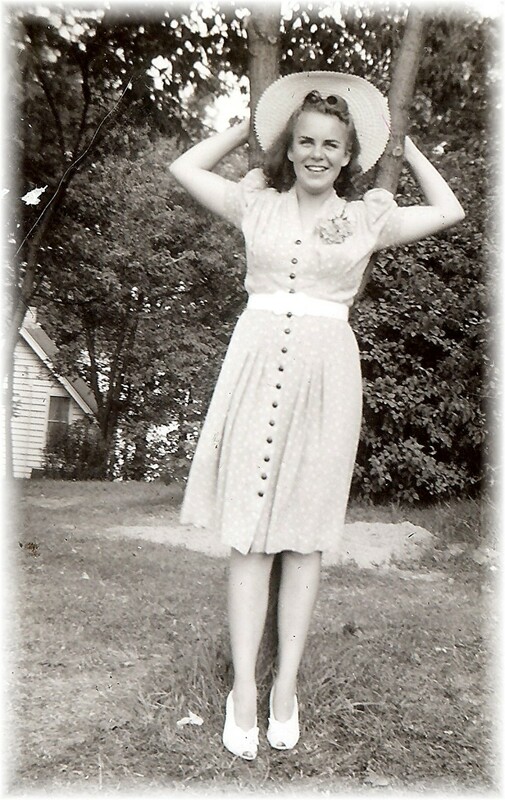 Of course no one in my opinion could have turned out any better than my dear mother. She always looked on the bright side of things and was a vivacious individual with an infectious laugh. I loved hearing the stories of her childhood and growing up years. Although she thought that she would have liked to become a nurse her parents dissuaded her from doing so and she instead went to business college after high school. Years later she worked at my dad's Real Estate and home building business so it served her well. 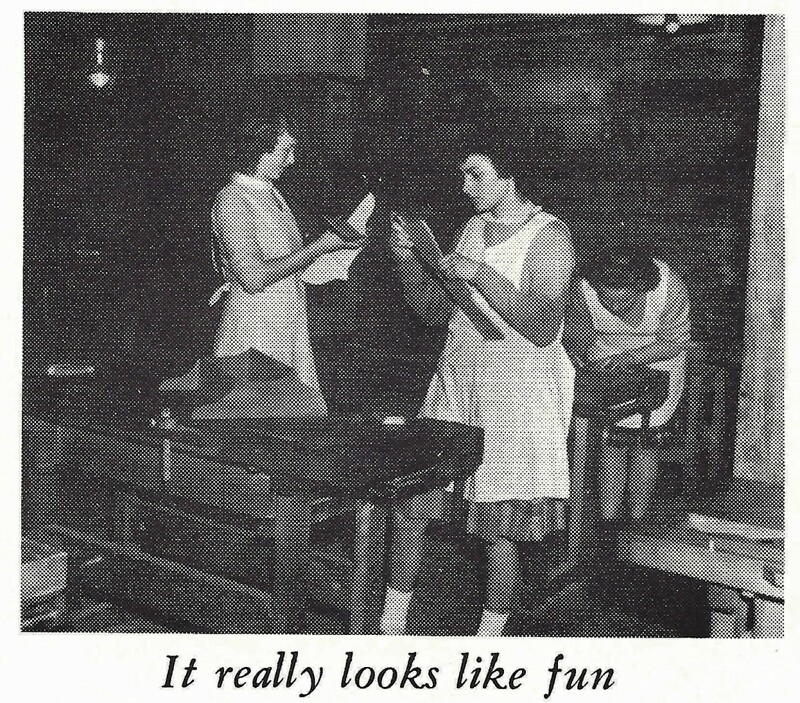 Carol's work in shop has given her a lot of fun although she was only one of five girls in that class. 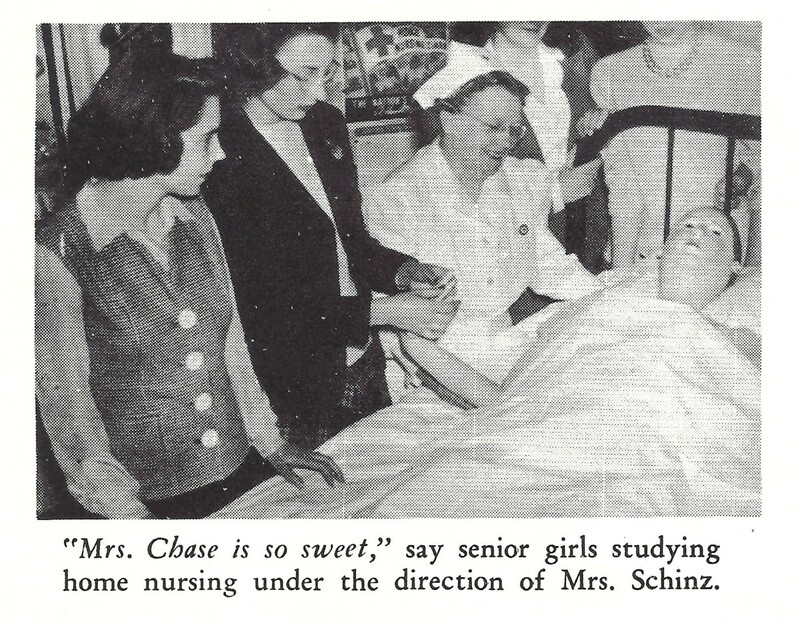 We hope that when she graduates she will leave her cheerful laugh to someone of the underclassmen, for the school would be a dreary place without it." Yes she took shop just for the fun of it. Who knew at the time that she and my dad would hand build the first home that I first remember as a child! To my dear mother Carol I dedicate this post. Others may also enjoy this 1943 annual to see the fashions worn during the first years of World War 2 at that time in Whitefish Bay. Do you have old high school annuals? Yes...older ones such as this one. Yes, high school football in Texas is legend. Yes, that's another reason not to have a footbal l team. 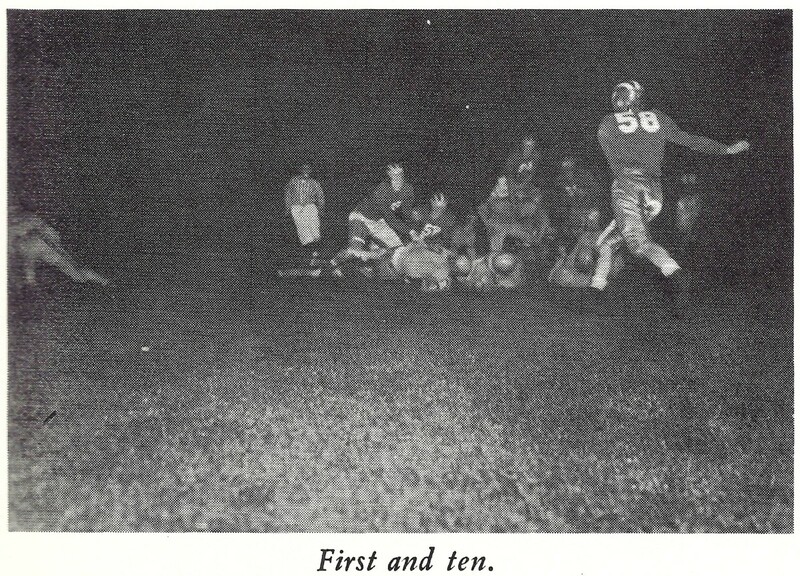 High School Football wasn't big in New York. Our school wasn't the best when it came to school spirit so there was no way to come close to justifying a team. Football teams take a lot of money to support. The same with a swimming pool for the school. Perhaps not the same amount of dollars...but if it is not in the budget...it is easy to realize why it was not implemented. Amazing...but true!...there was no swimming pool in the high school when I graduated. We did have a football team however. In Texas that is a given! Ha! 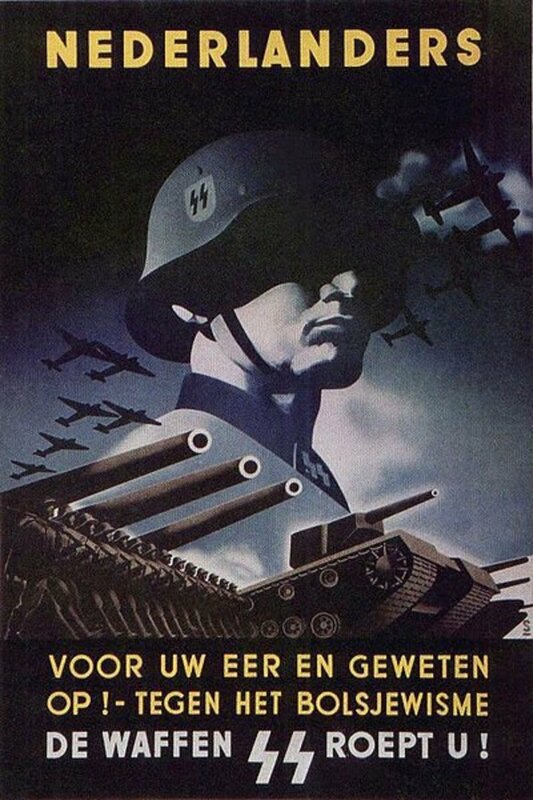 It surely was a different time back during the war years of the 1940s. There was also more patriotism back then on average supporting the war and our soldiers. Much has changed over the years for many different reasons. Wonder if that urban legend regarding your school was true? Ha! Great Hub. Yes, it was a different perspective. 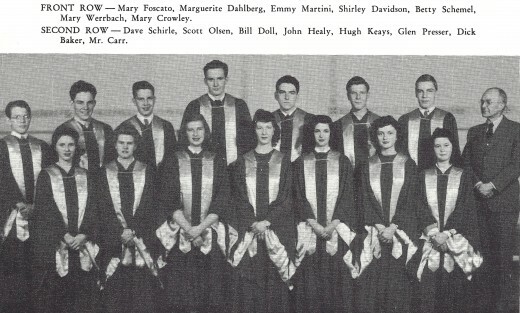 In '43 for boys graduation meant the next stop was the military and probably a ticket to a war zone. For girls graduation meant their high school sweetheart would probably soon be leaving for a war zone. 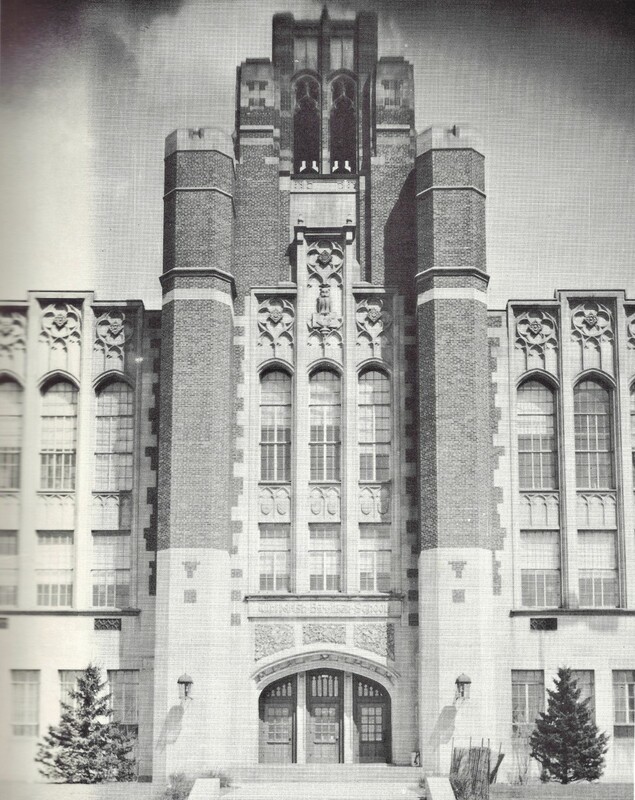 My high school also had "a tower". It wasn't popular because the school urban legend was the principal decided to add the tower instead of a swimming pool. Very happy to know that you enjoyed this look back in time. Thinking about day to day life during pivotal times in history can be thought provoking.Thanks for an interesting look at this high school, 1943. Your mother was indeed a lovely lady! So glad that you enjoyed reading this. After my mother was working as a secretary, when she would get off from work she volunteered to work in a factory that assembled items that would then float in the ocean should the ship be shot down...hopefully to be recovered. She and others that she worked with did the same thing. Everyone seemed to participate in whatever way they could to help win the war even if over here on the home front. She never really knew what the parts were but knew that it was important for the war effort. Thanks for the shares. This is an awesome and beautiful hub which I really enjoyed reading. My mother grew up in Marshfield but lived in ?Cudahay? 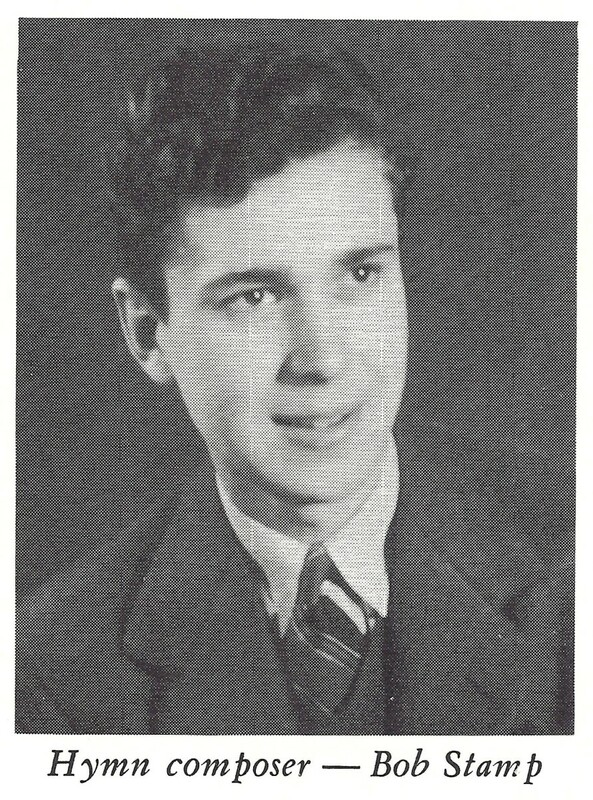 before meeting my dad in Milwaukee in 1943. 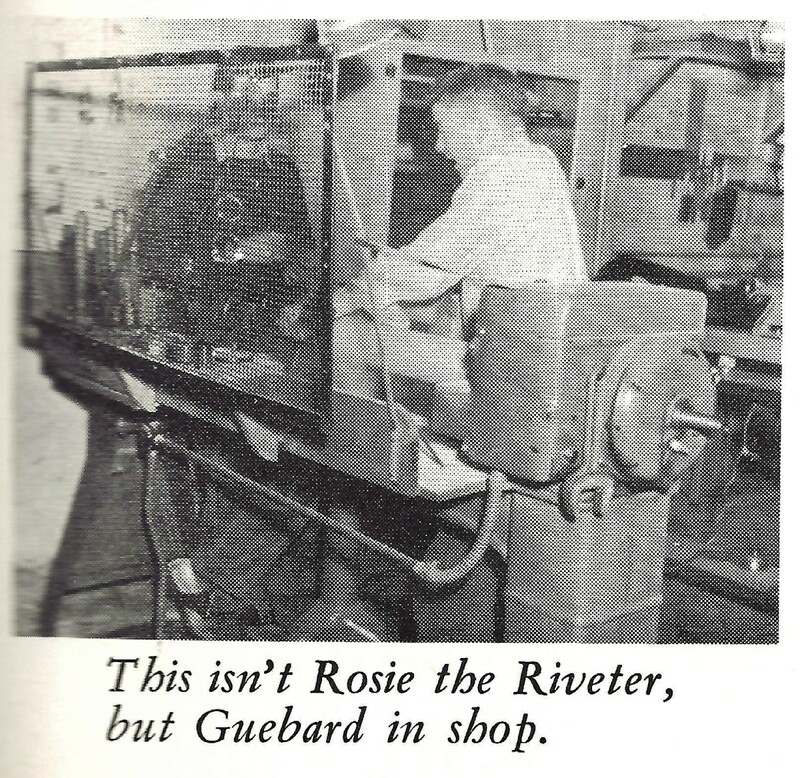 My mother only went through the ninth grade and was working with my dad at an ordnance plant in Milwaukee when they met. I have an old picture of my dad and his family which was taken in 1938 and styles of dress for young people look the same as the pictures from your mom's annual. My mother had a diary during the war, and I remember reading one time an entry in which she said you will never realize what we had to go through during the WW II years. It's surprising now to read that the army was taking 16 year old kids back then. I really regret losing the annuals I had when I went to high school! Voted up and sharing with followers and on Facebook. 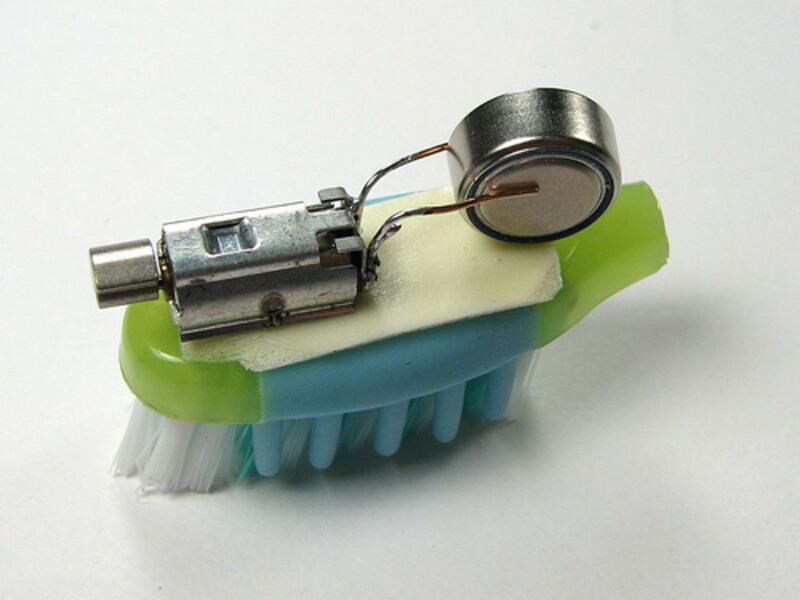 Also Pinning and Tweeting. Times were certainly different then and I do think that more people seemed to work together for a common cause then what we see today. Thanks! I liked this. It was interesting to read and see pics of a time long ago. Although actually that far in the past, it is of a time that seems like a different planet! What ever happened to respecting yourself and others, common politeness and working together?? It seems like today is all about what you can get, regardless of how you get it. The idea of working for a greater good seems lost, people talk about it sure, but rarely act that way ... such a shame. Shared, pinned, tweeted, up and interesting. I do think that life was better in many ways back in the 1940's with the exception of the war of course. Wars are never good no matter when or where they occur. People seemed to pull together for common causes and families seemed more intact back then. Thanks for your comment and votes. 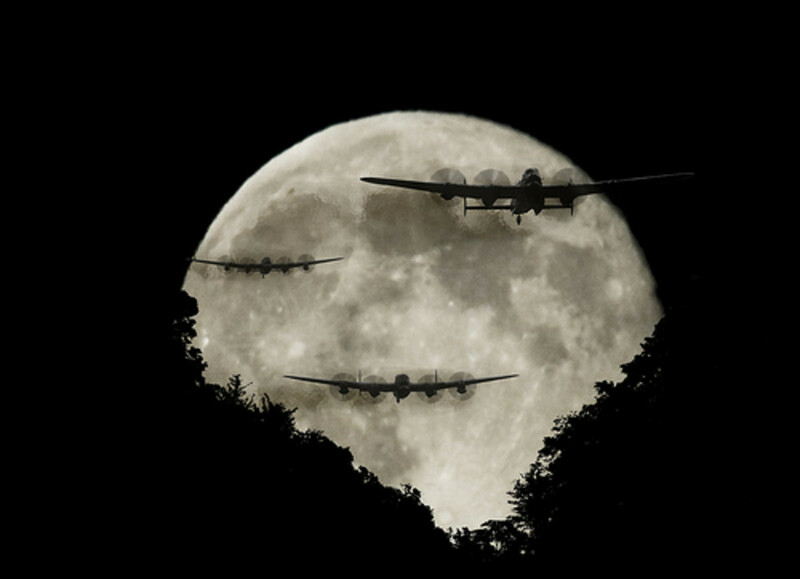 World War II was the last war in which the U.S. was involved where almost everyone took a part in one way or another. Whether it was not eating meat on certain days of the week, growing victory gardens, recycling and so many other things...the wars that we have engaged in ever since have never had the full support of people back home. Vietnam was probably the worst with protestors in the streets and our soldiers being called "baby killers" and worse upon their return. Too bad that there is ever a need for war! WWII was certainly a justifiable cause and while we tried as a nation to initially stay out of it, after Pearl Harbor, that was the spark that ignited our full participation in both theaters of war...Europe and the Pacific. My sibling are somewhat close to your mothers age. I think my oldest brother was about two years younger. My sister is four years younger. 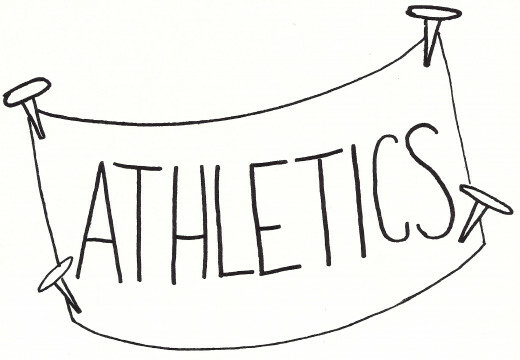 Except for a few weeks I never went to the same high school they did. I think a lot of the pictures here are reminiscent of pictures that I've seen of them. Odd that bugs bunny was used to promote bonds back then. My brothers best friend had a nickname of "Bugs" It may be because bugs Bunny was so popular then. You are right that everyone was aware of the war. Even as a child my early memories are related to the war back then. among these are paper drives, recycling just about everything. Newspaper comic strips were war related. Voted up,awesome and interesting. will share with followers, facebook and twitter. 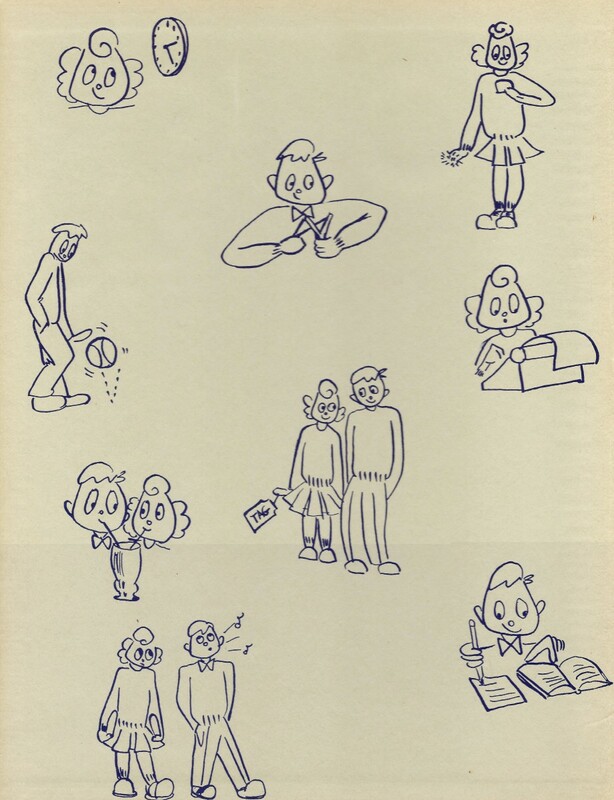 Thanks for adding all of this information about your experience while in high school back during WWII. My mother never told me that she was fingerprinted but perhaps that is because Milwaukee, Wisconsin was in the middle of the country and not on the coast. No chance of being hit by submarine gunfire. You should write an entire hub about your experience! Am sure others would be interested. It is a piece of history. When I was in grade school and the Cold War was in effect, we had regular drills where we would duck under our desks for when the bombs would fall. Kind of funny now thinking about it. Those who could afford it had bomb shelters. Fire drills were more the norm when I was in high school. Times have really changed! Am sure that 38 year old people still look "old" to 17 year old kids. :)) Thanks for your comment. I don't know where you got the idea that my dad was bedridden from this article. That is fortunately not accurate. 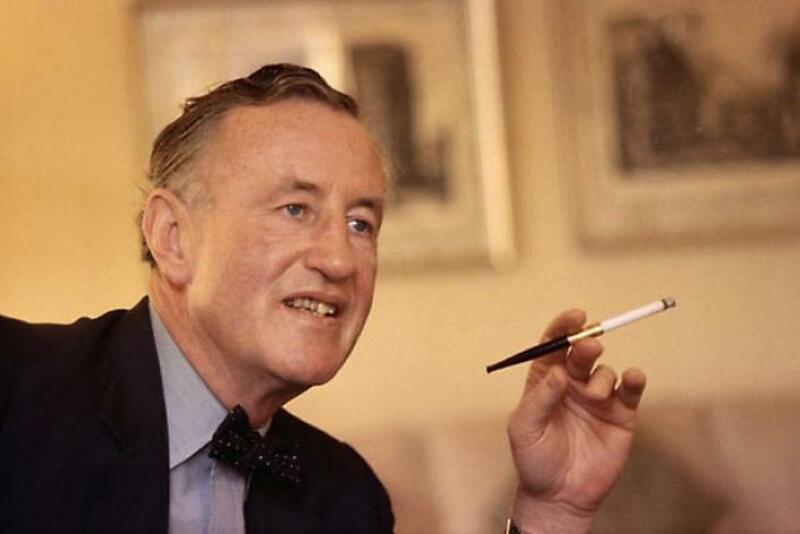 In fact, until nearer his death he was an active and hearty individual. 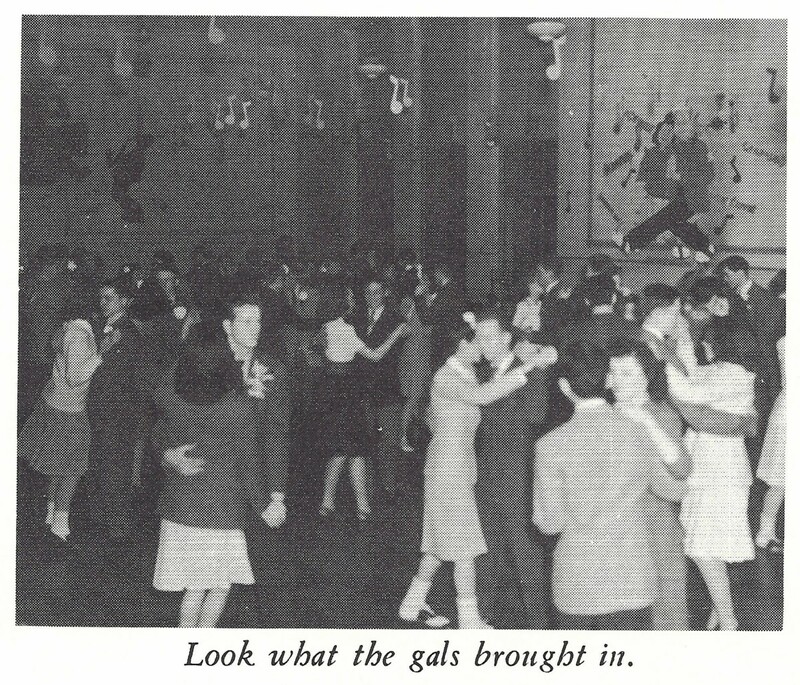 This was more about how high school years were back during the World War II era. Thanks for your comment and the share. As your fine article and all of those great photos made clear, the WW-II days were quite different than any days since. It is wonderful hub and I am sorry that your dad was bed ridden. I really liked the poem and the tower of the whitish bay high school. Again a very nice reading. Voting it up and sharing. Have you written about the Ghurkha warriors? That would be an interesting subject. Glad to know that you enjoyed seeing what transpired from a high school perspective...at least in Whitefish Bay...during World War 2. Everyone was involved in one way or another. Appreciate your comment. I find World War stories very interesting, I mean not the stories from frontline, but stories such as this one. Nepal did not directly participated in the great war, but fought for Allied forces. These fighters known as Ghurkha warriors, and their stories have always fascinated me. Nice to be able to share a glimpse of what it was like in the 1940's as far as high school students in Milwaukee, Wisconsin were concerned. Obviously WW2 was a big impact on their young lives. Thanks for your comment, votes and the share and thanks for the compliment about my mother. I also think that she was beautiful. Her inner beauty was even more beautiful all throughout her life. Your mother was beautiful and this is a wonderful tribute to her. 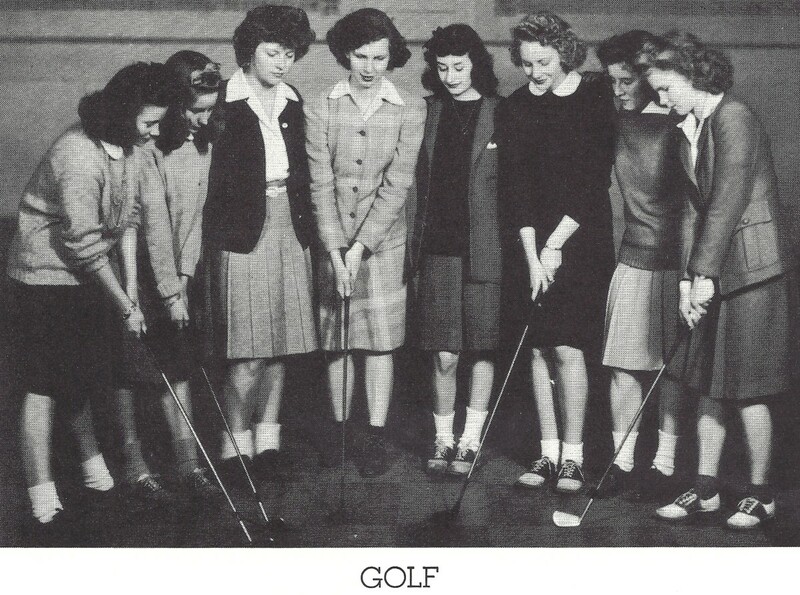 So interesting to read about what it was like and to see pictures from the 40s! A fantastic hub. I enjoyed it very much. Voted up, BAI, and will share! I enjoyed this so much. What a wonderful walk down memory lane..this was the time that my sister who is 18 years older than I am grew up. It was a time of giving for sure. My sister, Mother and Daddy told me about eating turnips for one whole winter. Thank you for sharing this...it was so interesting and gave me more of a peek into my eldest sister's younger years. Your Mother was so lovely in the photo. I know what you mean. Dress styles were much more conservative back in the days of the 1940's. Much prettier I think than many of the styles today. Guess I'm a bit old fashioned in that way. :) Thanks for the vote and the share. Your mom was so pretty. I loved seeing this don't know how I missed it. Great pictures. My favorite the drum majors, so nice to see girls without their you know what showing. Voted up and share. 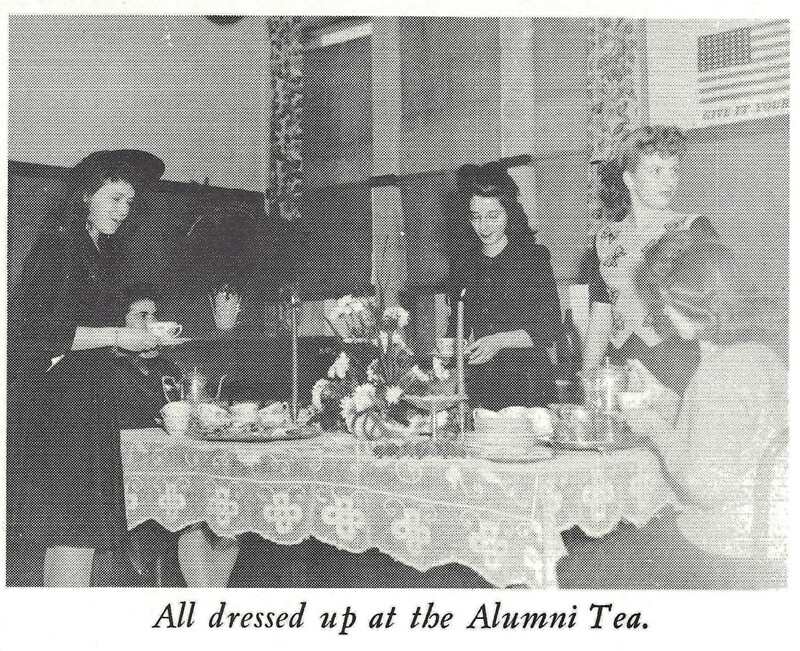 The dressing styles were certainly different back in the World War 2 era when my mother was attending high school in Wisconsin. 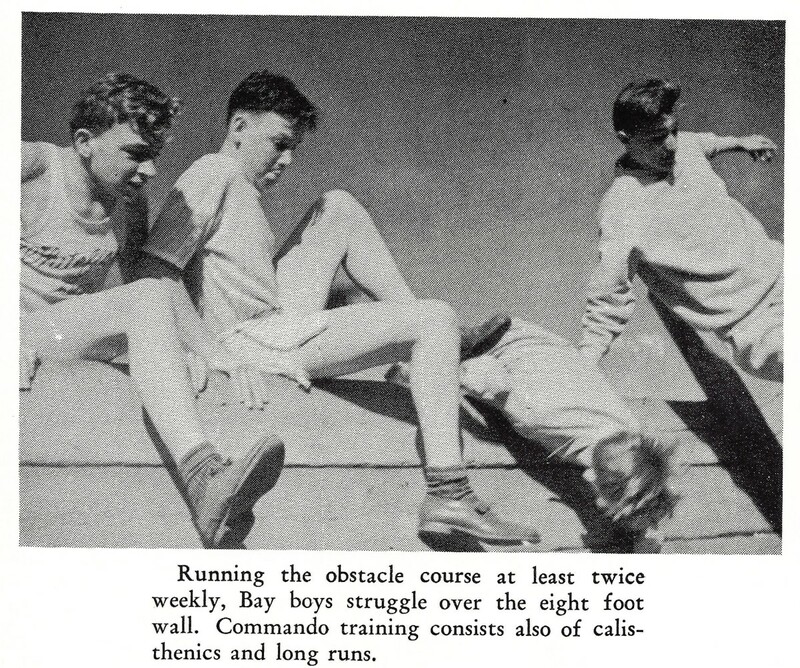 The student body at Whitefish Bay High School seemed to have a lot of fun but were also greatly involved in the war effort as these photos attest. Thanks for your comment, vote and the share. These pictures are fond memories for you while giving us a glimpse of school times of the past. Very enjoyable read and it is indeed a radical change from the dressing styles back then. The 2 World Wars had most people in our country pulling together for the common good and the war effort in general. I heard lots of stories growing up of the sacrifices people made in order for our soldiers and even our allies to have plenty of food and other materials. Rationing was commonplace as were victory gardens. Ever since those times it seems the only people who regularly sacrifice when it comes to war are the soldiers and their families. Thanks for your comment. I can't imagine living in that time frame. 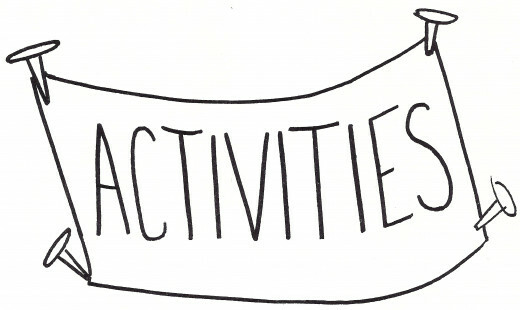 Having everything you do in some way or form being sent off to support the war. These are a great collection of photographs. I think old school photographs are the best even if I personally do not know the people in the pictures. You are very fortunate to know the stories that go behind these photos and documenting them for generations to come! My mother and my Aunt Lois always looked at life with the glass "half full" instead of "half empty." They both experienced lots of ups and downs in life but always retained their cheerful spirits. They were both hard working spiritual people who loved their families and cared for many others outside of their family circles as well. They left large footprints to follow! Thanks for your comment and the share. Beautiful would truly describe your mother and her friends, who truly found the positivity life had to offer! Thanks for sharing this, and I share too!! Back in that era lady-like manners were taught and passed on from generation to generation. It served them well and it still serves people well today who employ them. Good manners never go out of style as do fashions in clothing. We would do well to emulate the past with respect to things like that! Young boys were also taught to act like gentlemen. Glad that you liked this hub dating back to 1943. Appreciate your comment. I love this Hub. I am struck by the word used to describe your mother: Lady. I do not think this word is used anymore with any seriousness. And to me, this is one of the greatest shames of our nation. Just look at your mother, her best friend Lois, and the other girls in these precious photographs. They are ladies (or at least doing their best to be ladies in some cases). Thank you for this treasure trove of nastolgic loveliness. I enjoyed it very much. This 1943 annual is now in the mail on the way to my Aunt Lois's daughter Julie. She will safeguard it and pass it on to her children. Turning the pages of this old annual is like turning the pages of history. Nice to know that you enjoyed reading about it and seeing the old photos. 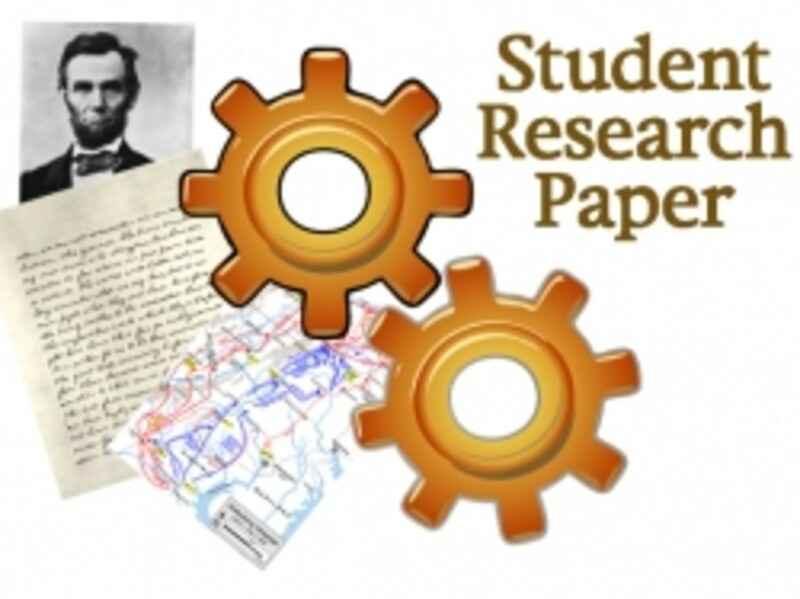 What a wondeful document and I'm glad you are preserving it. Some may argue that you can get the same info from the Internet, but the thing with the Web is that it can be changed at anytime. Books, on the other hand, are permanent records of their times. Voting this Up and Interesting. 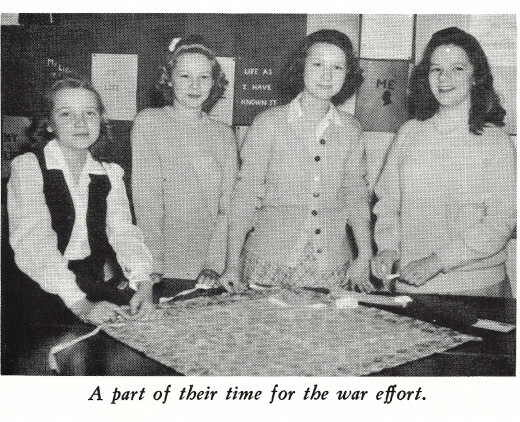 I thought that because of the historical nature of the time during WW2 that this high school annual and what the students accomplished would be of interest to others. Glad to know that you agree. Thanks for your comment and vote up. Your mother was a beautiful woman and from the sounds of it, beautiful inside, too. How nice that she always looked at the positive side of things. I loved browsing her photos. It reminds me of looking through my grandfather's photos. He was also from a large Germany family and fought in WWII as a young man. What a touching and well-written hub that gives us a glimpse of life at another time in history. Thanks so much...voted up! 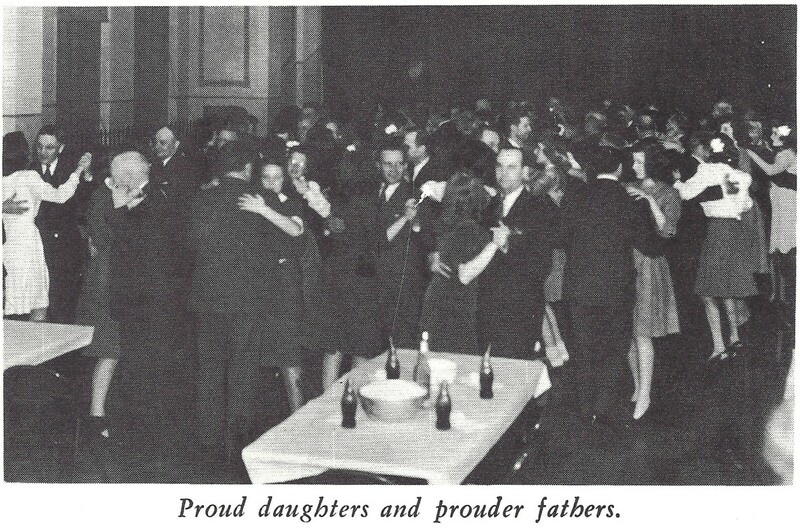 Yes, the youths were well intentioned and pulled together for a common cause back in those early days of World War 2. Thanks for your comments and vote up. Peggy, those youths really had good patriotism and spirit shown in their ability to buy those two military jeeps and varied positive clubs/activities they had amidst unfavorable condition during the war. That gives a good model for today's young generation to do the same and even more. Thanks for your visit again and confirming that people of this era deserved the title "the greatest generation." From what I have experienced in life...I believe that it is true! Thanks for the share. What a wonderful memory you've written in this hub. Those varied clubs and their success in funding the purchase of two army jeeps showed those youths spirit and support for the country amidst unfavorable condition due to the war. Thank you for sharing this interesting story and vote up for this rare hub too. Beautiful, Peggy. It's like flight with time machine in the past. I really enjoy reading this hub and watching all the vintage pictures. Thanks for writing and share with us. Voted up! They sure did deserve the title. Shared with honor, Peggy. Thanks for your visit and comment. 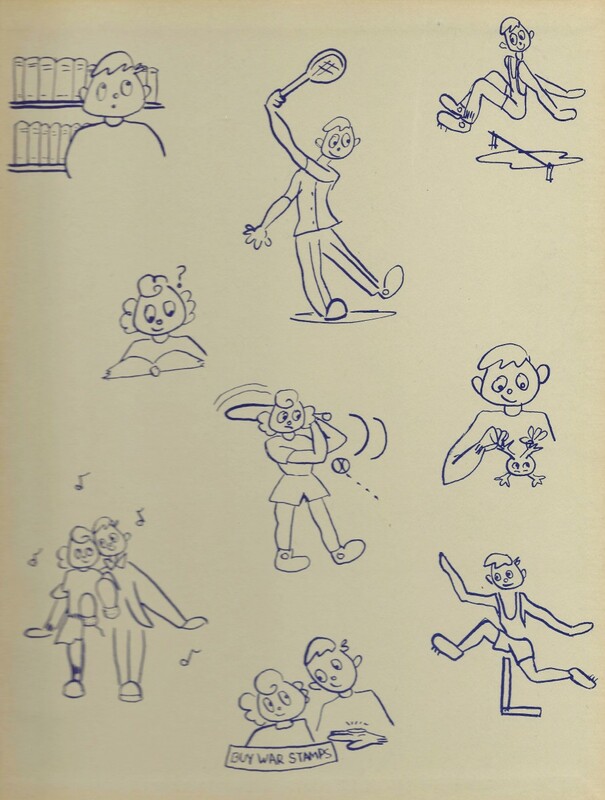 This 1943 high school annual shows much more than styles of hair and dress back then. It shows the generosity of spirit and work ethics of students along with some of the fun activities in which they engaged. WW2 was a prime influencing factor in their lives. Even after my mother started working following her high school years...she donated time after work to help with the war effort. Most of the people back then DESERVED the title..."THE GREATEST GENERATION." The "real treasure" was my Mother and my Aunt Lois, both of whom made the world a better place in which to live. Whitefish Bay High School appeared to be a great place in which to learn important life lessons at that stage in their young lives. Thanks for your comment. Ah Peggy, this was a lovely look at your mother's '43 annual. The Whitefish Tower looked like a big college campus entrance. Especially enjoyed the candid shots- the pipe smoking muscle boy lol- and the sections on your mother and Lois- both attractive young ladies. This hub really shows what American youth were like back then. Wow! Thus was really something, Thank you so much for sharing. You have a real treasure. So glad that you enjoyed this look at the past during the time frame of World War 2 and how it affected students at the high school in Whitefish Bay, Wisconsin. Thanks for your comment. 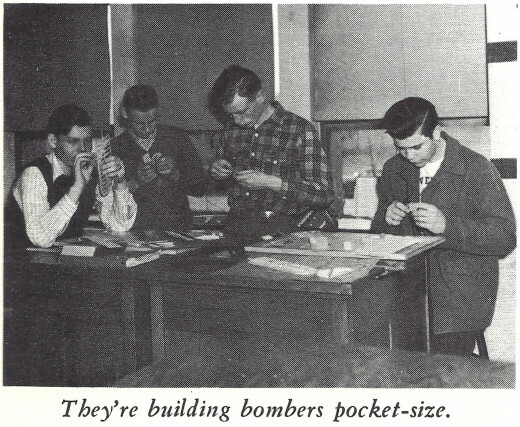 It was nice to be able to share images and stories of what the Whitefish Bay High School kids were doing in 1943. You got to meet my mother and know her inner beauty which, after all, counts more than anything. Thanks for your lovely comment. Appreciate your wonderful comments. 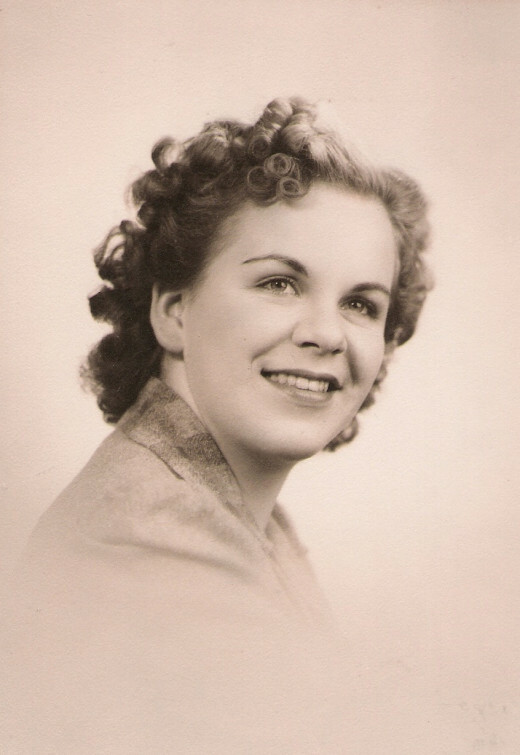 My mother was a really special person who enriched many lives as she crossed paths with them. I miss her dearly! Thank you for the votes and the share. It is amazing what can be learned by looking back at old high school annuals. Considering that 1943 was a war year, I feel that this particular one held even more interest beyond who were the teachers and students. 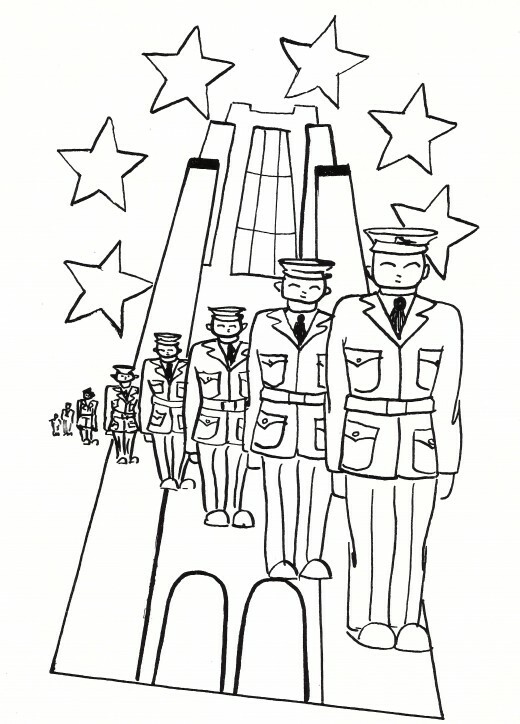 Their focus on helping the war effort was exemplary. Appreciate your comment. So nice to know that you enjoyed this look back in time especially since it was in your era. How many kids were in your class and where did you graduate from high school? Are you in touch with any of your high school buddies? Thanks for your comment, votes and the shares. 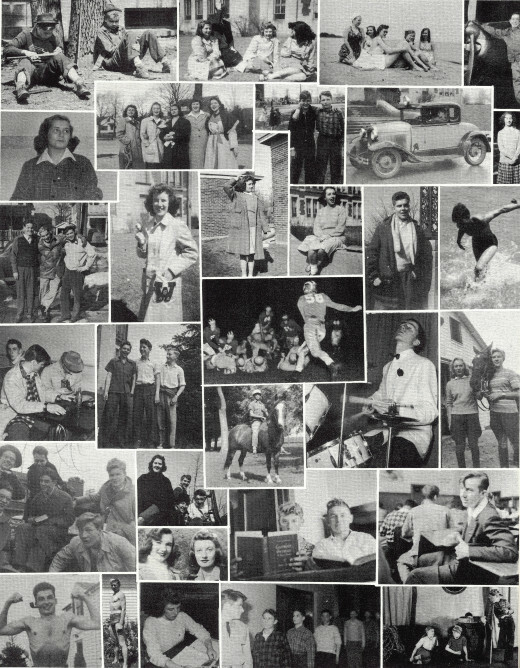 This is a very interesting look at a specific period in the past, Peggy, and it's also a beautiful tribute to your mother and the other students at Whitefish Bay High School. Thanks you for sharing all the information and photos. Oh Peggy, Another inspiring and beautiful hub. Your tribute to Ms Carol made me think of her beauty inside and out. 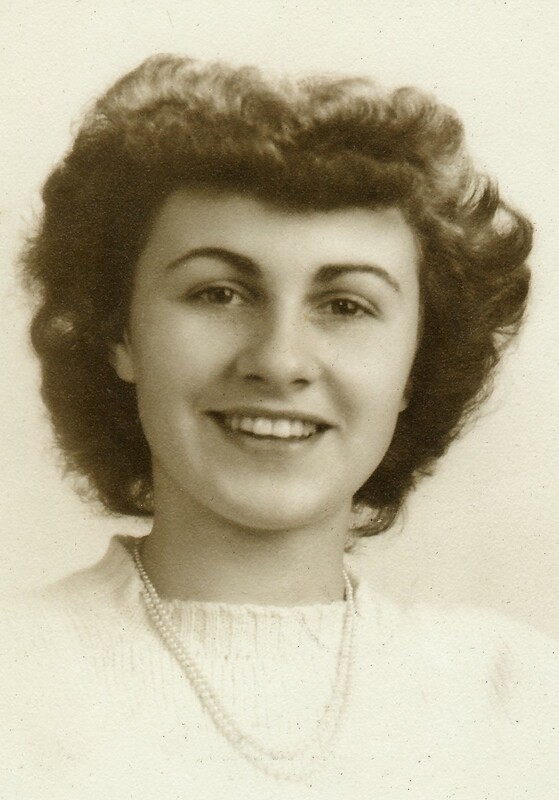 Your Aunt Lois was a beautiful lady too. You are a beautiful writer and artist. 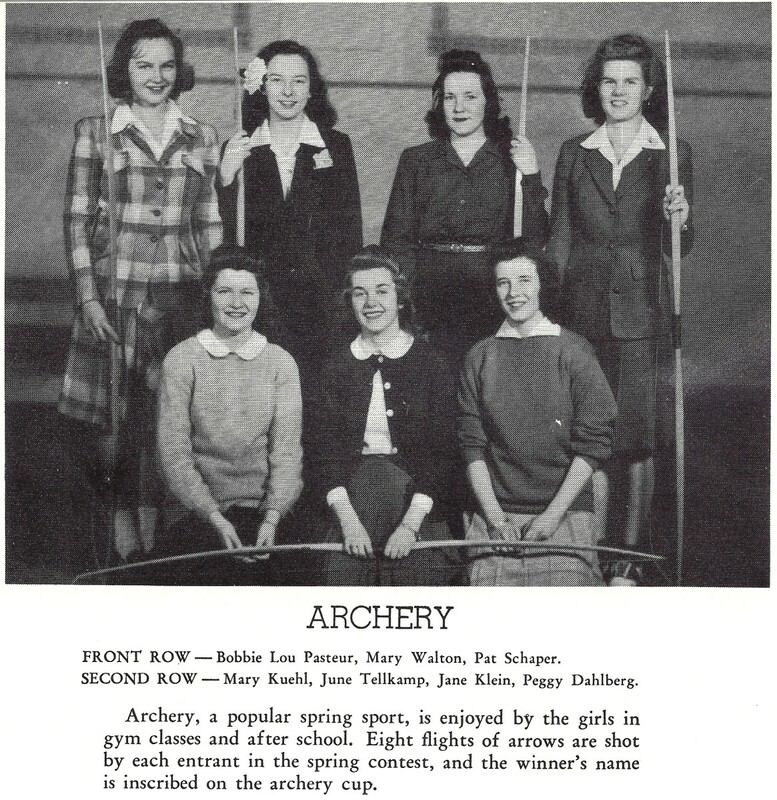 The 1943 Whitefish Bay High School Annual is a great treasure, complete with beautiful memories. Another awesome hub, photos and tribute to your beautiful Mother. Hi Peggy great hub dedicated to the memories your mom once lived,enjoyed reading this wonderful story and loved all the old photos ! Your mom was very beautiful and you said inside and out and I'm sure you take after her has well. The tribute to those going to serve in the armed forces was really nice. Apparently many of them did so and those left behind did a lot to help the cause during the days of World War 2. Glad that you enjoyed reading this. Thanks for your comment. Peggy, this was a nice history of your mom's life. I enjoy looking back at the yearbooks for this purpose. Well, I graduated High school in 1945 (did I just tell my age??? ), and I have four of my school annuals. We didn't have the money to have them printed at my little school. We typed the pages and ran off copies on our machine at school and put them together. I loved looking at the photos, the saddle oxfords, the hair styles, etc. Your Mother was a beautiful girl! Thanks for sharing this album with us. I voted this UP and will share and Tweet. Hi Peggy, What a Beautiful Hub and Tribute to your Mom...I'm sure she is looking down and Smiling in Approval. 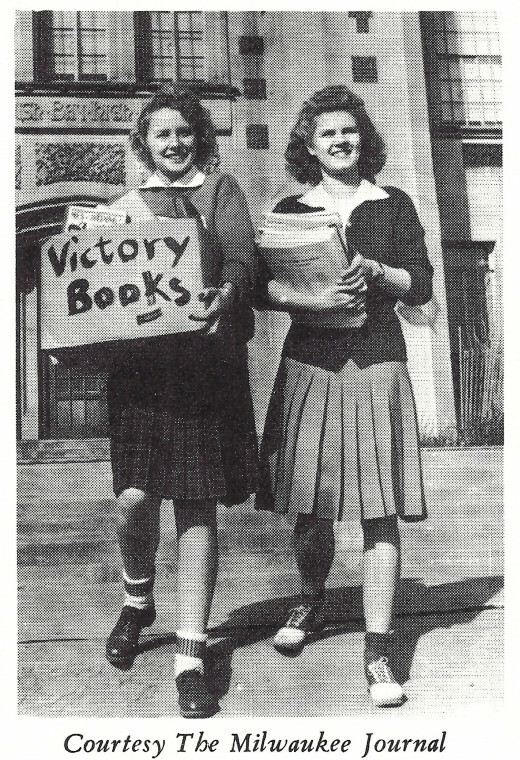 I too Enjoyed seeing that the year Book was dedicated to the Students & Teachers who would be going off to serve in WW2. Very, Poignant. Thanks for sharing. What a flattering thing to say because I thought of my mother as being beautiful. I don't compare in my opinion. She was beautiful in every way both inside and out. Thanks! Man, do you look like your Mother! Great look back. That generation of folks deserves the title "The Greatest Generation." Morals and values were much higher than today. Hard work was valued and when set-backs came along, they just rolled up their sleeves and tackled the problems with more vigor. So sorry to hear about your mother's recent passing. Going through your mother's things is hopefully giving you some comfort. Am sure that you are learning things much as I have been. God bless you and your mother. Will have to plan a get together soon! Thanks for your comment. How lovely! 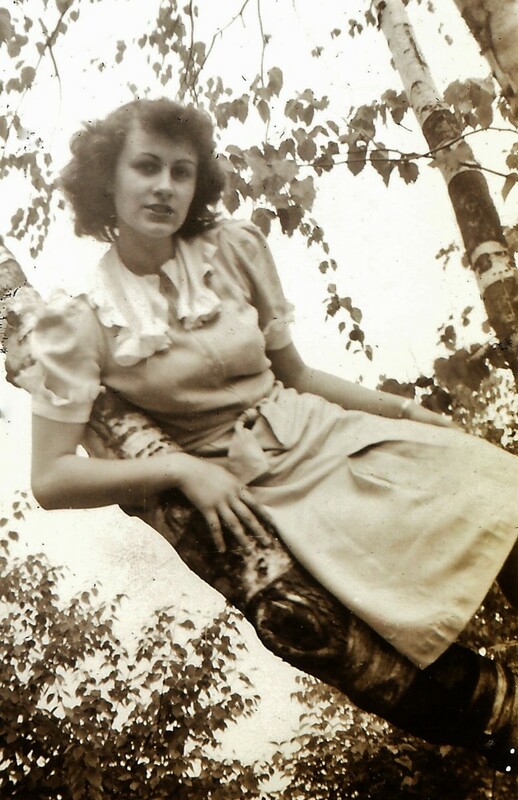 With my mother's recent passing and going thrjough 89 years of accumulation of pictures it does give you a side of your parent and what there lives were really like. In spite of a war, they seemed to move forward at all times, meeting their goals with hard work and belief in a country that was so very regarded, to bad a lot of folks don't have that respect now. I thought it was interesting how the entire book was dedicated to the students & even teachers who were leaving the school to engage in WW2. Also amazing to me that the students did enough fund raising to purchase 2 jeeps among their other endeavors. Nice that you have family mementos that you cherish. Thanks for the first comment, vote + share. Peggy, I loved taking a look back at your mom's annuals from the 1940's. This was my grandparents era, but I too am fascinated by it and even have old letters that my grandfather wrote my grandmother when he was drafted and in the army. I cherish them and can see how you too cherish these books of your mom's. This was a beautiful dedication to her and thank you for sharing these with us. Have voted up and shared too! !